Paid social media advertising, ie. Facebook ads, promoted posts, etc. Sessions with Anne Popolizio will begin on May 5, 2017 at 3:00 PM EST. You can register for this event here: Super Hero Consultation Day. “I understand first-hand the challenges small businesses and non-profits face in their marketing. There is a ton of information out there, and sometimes you just need your question answered to set you off in the right direction. I am glad we are able to participate in this event for Small Business Week,” says Popolizio. Constant Contact Solution Providers are businesses that provide marketing-related services tailored to the needs of small businesses or nonprofits—such as web design/development, marketing consulting, advertising, digital media, and more. They use Constant Contact’s online marketing tools to generate more business for both themselves and their clients. 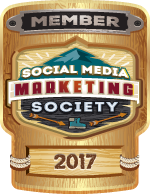 Social Squib is a boutique digital marketing agency serving small businesses and non-profits. With extensive experience in both the non-profit sector and small business marketing, Social Squib is able to provide customized solutions designed to help you achieve your goals within your budget. Constant Contact, an Endurance International Group company and a leader in email marketing since 1995, provides hundreds of thousands of small businesses around the world with the online marketing tools, resources, and personalized coaching they need to grow their business. For more information, visit: http://www.constantcontact.com.